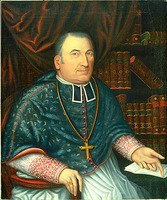 GAULIN, ANTOINE, priest of the Séminaire des Missions Étrangères in Quebec, missionary to the Abenakis and Micmacs of Acadia and Nova Scotia; born at Sainte-Famille, Île d’Orléans 17 April 1674, son of François Gaulin, farmer, and Marie Rocheron; ordained priest at Quebec, 21 Dec. 1697; died at Quebec 7 March 1740. Gaulin came to Acadia in 1698, and the following year replaced Father Thury* as missionary to the Abenakis at Pentagouet (near Castine, Maine); Father Philippe Rageot served as his assistant. In this early period Gaulin committed himself to fighting the brandy trade operated by Claude-Sébastien de Villieu. On 5 Oct. 1702, he was named vicar-general in Acadia by Ango Des Maizerets. It was at this time that Gaulin revived Thury’s plans to gather the Indians of the Penobscot area into a large mission near Canso, far from New England. The plan was thwarted in 1707, however, when the English captured the supplies intended for the new mission. War with the English intervened, and that same year Gaulin, with Bernard-Anselme d’Abbadie de Saint-Castin, led his Indians to meet the invading English commanded by Colonel John March. After the capture of Port-Royal (renamed Annapolis Royal) in 1710, Gaulin, acting on instructions from Pontchartrain, had his Indians raid and harass the English to prevent them from becoming solidly established in Nova Scotia. The English garrison was commanded at this time by Samuel Vetch and by his lieutenant Sir Charles Hobby. Gaulin was unable to lead an all out attack on Annapolis Royal however, because the ship bringing clothing, arms and munitions to his Indians was captured by the English. 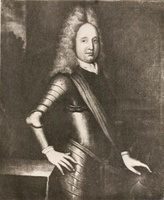 Between 1717 and 1720, after France had founded a new colony on Île Royale (Cape Breton Island), Gaulin succeeded in bringing together a great number of Micmacs from the peninsula in a large mission at Antigonish – within English territory but close to Île Royale. Later he established missions at Cape Sable, La Hève (La Have), Shubenacadie and Mirligueche (near Lunenburg). Gaulin and fellow missionaries Justinien Durand* and Félix Pain* were less successful in encouraging many Acadians to move to Île Royale. In 1718 Gaulin went to France to solicit assistance “for the benefit of religion and the advantage of the colony.” With increased funds he was able, in 1727, to carry out a census of Acadians in Nova Scotia, and with his assistant, Michel Courtin, to translate prayers and a catechism into the Micmac laiiguage. His new resources also enabled Gaulin to perform better his duties of proselytizing, maintaining among the Acadians some loyalty for France, and preventing the Indians from signing a peace treaty with the English. These activities led Lawrence Armstrong, the English lieutenant-governor at Annapolis Royal, to call him before the executive council in 1726; the council restricted him to the post of curate at Minas (Les Mines). At the same time the French were accusing him of encouraging peace between the English and the Indians; however, the accusations were subsequently proven false. His health was now broken by years of service; he lived quietly at Minas until 1731 and then at Annapolis until 1732 when he retired to Quebec. Gaulin was feared by the English because of his powerful influence among the Indians and Acadians, trusted by the French as their chief contact with the Indians, and beloved by the Indians for whose welfare he went deeply into debt. Gaulin is depicted in an ex-voto at Sainte-Anne de Beaupré, in which he is a passenger on a storm-tossed ship being saved by Saint Anne. AN, Col., B, 27, f.28; 29, ff.7, 29; 33, f.42; 34, ff.85, 111v; 35, f.32; 36, ff.445, 447, 448; 37, f.226; 42, f.472; 48, f.410; 49, f.705; 50, f.581; 52, f.586; 53, f.24; 55, f.563; 57, f.744; 58, f.516; C11A, 18, ff.139–41; C11B, 1, f.249; 2, f.237; 3, f.42; 4, f.251; 5, f.358; 6, f.77; C11D, 4, f.45; 6, f.250; 7, f.177; 8, f.3. ASQ, Fonds Amédée-Gosselin, 49; Polygraphie, IX, 23c. PAC, Nova Scotia A, 15, pp.150ff. ; Nova Scotia B, 1, pp.96–97, 99–101, 104ff. ... Coll. doc. inédits Canada et Amérique (CF), I (1888), 190–93. Coll. de manuscrits relatifs à la N.-F., II, 336–37, 385, 466, 504, 566; III, 126–27. “Correspondance de Vaudreuil,” APQ Rapport, 1939–40, 337. N.S. Archives, I, 68–69; II, 77; III, 204. Allaire, Dictionnaire. Caron, “Prêtres séculiers et religieux,” 295.. ... Bernard, Le drame acadien. Casgrain, Les Sulpiciens en Acadie. Gosselin, L’Église du Canada, I, 368; II, 229. Harvey, French régime in P.E.I. A. A. Johnston, A history of the Catholic Church in eastern Nova Scotia [1611–1827] (1v. to date, Antigonish, 1960), I. McLennan, Louisbourg. Gérard Morisset, Peintres et tableaux (2v., Les arts au Canada français, Québec, 1936–37), I, 54. P.-G. Roy, L’île d’Orléans (Québec, 1928), 363–65. R. V. Bannon, “Antoine Gaulin (1674–1740): an apostle of early Acadie,” CCHA Report, 1952, 49–59. David Lee, “GAULIN, ANTOINE,” in Dictionary of Canadian Biography, vol. 2, University of Toronto/Université Laval, 2003–, accessed April 20, 2019, http://www.biographi.ca/en/bio/gaulin_antoine_2E.html.